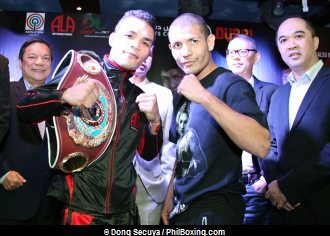 DUBAI, UAE – ALA mainstays Genesis ‘Azukal’ Servania, ‘King’ Arthur Villanueva and comebacking Rey ‘Boom-Boom’ Bautista came face to face with their Latino opponents Thursday afternoon during the press conference and official weighin of ‘Pinoy Pride XXVII’ held at Rocky’s Cafe at the Regent Hotel Palace here, the first international roadshow of the highly successful Pinoy Pride Series, a partnership of ALA Promotions and the Philippines’ largest TV network, ABS-CBN. The fights will be held tomorrow evening, Friday, at the Dubai World Trade Center. Servania (24-0-0, 10KO) from Bacolod City, who will defend his WBO Inter-Continental super bantamweight title against Jose ‘Matador’ Cabrera (22-4-2, 10KO) of Mexico, promised to have an impressive win Friday night as he look forward to fight for a world title possibly next year. “We trained hard for this fight for three months and we are very positive for this fight,” Servania said. However, his opponent, Cabrera, had another plan and looked forward to have his hands raised after the battle. “I have all the experience I need to be able to beat Servania,” declared the articulate Cabrera who fought the likes of Omar Narvaez and Tomas Rojas. Servania weighed in at 121.4 lbs while Cabrera tipped the scales at 122 lbs, the superbantam weight limit. Appearing as a co-feature is Villanueva (25-0-0, 14KO), also from Bacolod City, who will face Henry ‘El Crespo’ Maldonado (19-3-0, 14KO) of Nicaragua for the IBF International junior bantamweight title. Villanueva who is highly rated by all four major boxing organizations, is quietly confident in facing Maldonado who had a difficult time getting the weight limit. Villanueva weighed in at 114.6 lbs while Maldonado came in at 115.8 lbs on his first try but made the weight limit of 115 lbs after perspiring himself with the over 100 degrees farenheit Dubai heat outside of the hotel. The ever-popular ‘Boom-Boom’ Bautista (35-3-0, 25KO), meanwhile continues his comeback bid against dangerous Mexican banger Juan Jose ‘Piquet’ Martinez (19-1-0, 15KO) for a 10-round super featherweight non title bout. Martinez, who endured an 18-hour flight to reach Dubai, said he had great sparring coming in and expect to come out the winner on Friday. “I will go up in the ring with nothing else in mind but to come out the victor… and the winner of this fight is the public because they will see some awesome boxing,” Cabrera said. Bautista, for his part, said that he had reviewed Martinez’s fights and that Martinez fights like a bull. “I respect Mexican fighters,” Bautista said. “But come Friday night, the respect will no longer be there,” he added. Bautista came in at 129.4 lbs. While Martinez stepped the scales at 131.6 lbs. Servania (L) and Cabrera pose during the weighin. L-R: TFC Regional Marketing Head for Middle East and Europe Maribel Hernaez, ABS-CBN Vice President for Sports Peter Musngi, ALA Promotions President Michael Aldeguer, ABS-CBN Head of Management March Ventosa and ABS-CBN Head of Intergrated Sports Dino Laurena. ALA Promotions president Michael Aldeguer as well as ABS-CBN executives Peter Musngi, March Ventosa, Dino Laurena and Maribel Hernaez were proud but at the same time anxious to stage their first international show in Dubai. “This is something big for all of us,” Aldeguer said. This takes years of planning and finally it’s here. We’re looking for bigger shows next year,” Aldeguer said who mentioned putting up shows, aside from Dubai, also in Abu Dhabi, Qatar and of course in California where ALA Promotions had already been licensed. On the eve of ‘Pinoy Pride XXVII’ however, all indications point to the successful staging of the event as tickets have almost sold out. 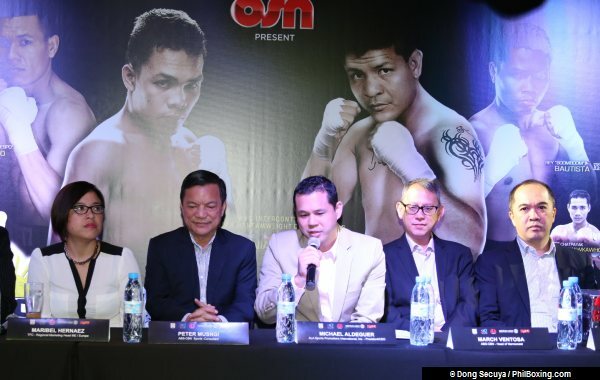 Spicing out the night on the undercard are local based boxers headed by Larry Abarra, a Filipino who fights out of the Round 10 Boxing Club of Dubai, will face Chatpayak Nuengkawkawhok of Thailand in a four round superbantamweight bout. Abarra came in at 121.8 lbs while Nuengkawkawhok weighed in at 120.6 lbs. Kizito Deo of Uganda will be pitted against Anusher Abdullaev of Uzbekistan in a four round welterweight clash. Kizito weighed in at 142 lbs while Abdullaev stepped the scales at 147 lbs. Junior welterweights Mohammad Akram of Syria and Thailand’s Kong Windy Sports will fight in another four rounder. Akram is also based in Dubai’s Round 10 Boxing Club. Akram weighed in at 140.6 lbs Kong Windy came in at 140.6 lbs. 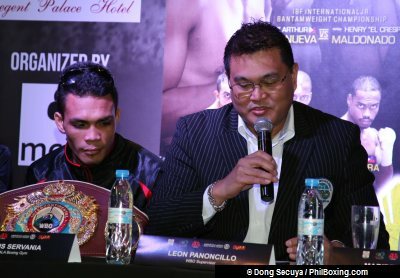 WBO Vice President Leon Panoncillo (R, above photo) will supervise the main event fight between Servania and Cabrera for the WBO Inter-Continental super bantamweight title while IBF’s Onesmo Ngowi will supervise the fight between Arthur Villanueva and Henry Maldonado for IBF International junior bantamweight title. 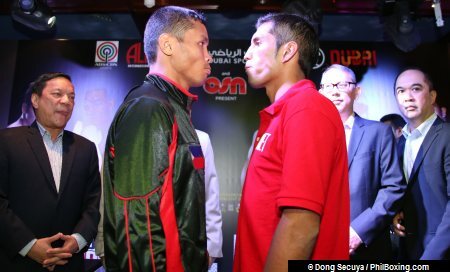 The first fight will start at 7:00 p.m. Friday night at the Dubai World Trade Center and will be broadcast live in the Philippines by pay per view and will replayed by ABS-CBN Saturday night.